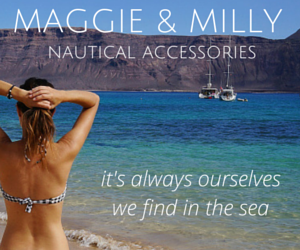 Only a few small projects have been worked on for the boat this month. The table in the salon Matt had taken out a few months ago is complete. He shaved off a few inches from the aft end to make squeezing into the port side settee a little easier. He was also able to refinish the teak and add a triple stainless steel tracker cup holder which is great because it doesn’t take much for me to knock over basically anything. My progress on the dodger is slow, but at least it’s still progress. After having it out with the sewing machine and some nasty name calling on both sides we decided that time apart would be the best thing for us and I’m still sewing by hand. It is incredibly time consuming but the stitching just comes out terrible when I try it any other way. 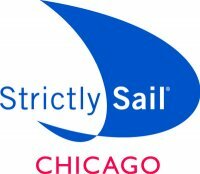 Then there’s also that one thing in late January that most sailors in the mid-west look forward to, and that’s Strictly Sail Chicago. We planned on going only on Friday since it went into our schedule better. It’s about a 2.5 hour drive for us, so after dropping off the sailing greyhound at grandma’s , picking up another solar panel in Michigan City, and passing through 3 toll booths in a car where the drivers-side window doesn’t go down, we made it to Navy Pier just before the show opened. Mostly on our schedule that day was attending seminars, all put on by the same hosts, John Neal and Amanda Swan Neal of s/v Mahina Tiare III. John and Amanda are a very nice couple who charter expeditions on their boat through New Zeeland and the South Pacific. As much as Matt and I would like to join them for one of these trips our pockets aren’t quite deep enough at the moment so we thought we’d see what kind of information we could pick up on dry land. The first seminar we attended was ‘Ocean Voyaging Preparation’. Not that we’d be completely unprepared without this seminar since all that Matt does from the time he wakes up every day to when he goes to sleep is research things online that will prepare us for ocean voyaging, but it’s nice to have the chance to hear from someone person to person on what it is like. 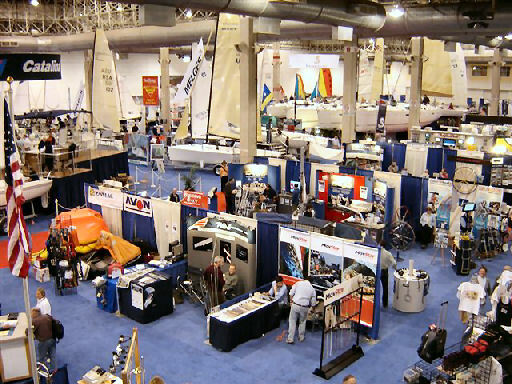 We were the first ones in the seminar and John was more than happy to greet us and get us set up with an itinerary, a free copy of Blue Water Sailing, and lots of other goodies. As other people started to file in Amanda came to have a seat near us to ask about our sailing experience, boat, and future plans. For some reason I was overcome with a terrible bout of shyness and wasn’t able to get out much more than my name and my boat. I’m used to Matt being the talkative one between us and since he was in another conversation I was on my own and words just seemed to escape my mouth. It was a shame because the seminar was very helpful, and some one on one time could have benefited me greatly. After the first seminar we had a few hours to kill and decided to see if we could find me a good deal on foulies. We checked out a few vendors including Slam and Henri Lloyd, where I hobbled around getting ‘dressed and undressed’ about 10 times, before I settled on a nice pair of drop-seats from Gill at the very low price of $79. At the sight of the decent quality and cheap priced tag Matt picked up a pair for himself as well. Only problem is that except for size and the drop-seat on the back of mine, they look exactly alike. We worried a little that if we had to get them on in a hurry how we could keep from mixing them up. I told Matt I’d be more than glad to sew some flowers on the leg of his so we would know who’s are who’s. Bright pink flower designs? I think he’d love it. With an hour left still before the next seminar we made our way to the area of Navy Pier with all the food stands. Years in the past I had always picked McDonalds because I thought I was being cheap and saving us a little money. And every year I’d forget that the cheapest combo on the menu of a McDonalds located in Navy Pier is about $7. So this year I got what I was really craving and that was a burrito from a stand I’d been eyeing our past two years here. I was so excited to dig into it until I took a bite and realized it was the most bland thing I had ever tasted. Since Matt ordered the same thing as me I asked if his had any flavor. It was the same thing for him. Guess I would have been better of with my chicken nuggets. Looking at our watches we realized the next seminar by the Neals of Panama to New Zeeland was starting in 15 minutes. Racing back to the room we thought we were making it in with two minutes to spare and pulled the doors open to take a seat. When we saw the room was already full and the lights were dimmed we realized we had read the schedule wrong and were already late. Quickly taking a seat in the back I pulled out my notebook to jot down any information that might be helpful to us on our own journey through that area. We got a lot of good information on the islands, even where to find free showers and the cheapest food at market. And since we’ll be hitting some of these islands just after the Marquesas where we’ll be living of the government regulated cost of bread since a burger at a restaurant can run upwards of $18 USD, those are good things to know. With 30 minutes between this seminar and the next one of Mastering Storm Avoidance & Survival Tactics we thought it best just to stay put and not interrupt again. At the end of the next seminar with more good notes it was only around 5:00. The past few years we’d be able to wander around for hours looking at each booth and what they had to offer. Now we were a little older, wiser, poorer, and slightly jaded. We knew every booth because we’d already been there before. The great prices that had seemed so low before were always beat out with deals online (as Matt found after his hours of research). Other than the seminars there was nothing for us this year. Although it was great to get out of the house for a day and cross that magical line between Michigan and Indiana where the 28 straight days of overcast weather turns into sun (it literally happens every time we go to Chicago), all I wanted to do at that moment is pick up my dog, throw a movie on the projector and enjoy a glass of wine. It’s always nice though to have that reminder of what’s waiting just around the corner for you as the snow melts and the covers begin to come off boats. Mid-west winters can be tough, but they never last forever. I can almost taste summer now.